We’ve been making headway on our project at Allen Avenue. 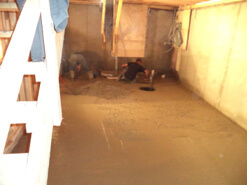 The walls have been insulated, basement drains completed and the basement slab has been poured. As you can see, things are looking great as they really start to take shape! Here’s a few pictures with information about the process. We also added some of our reasoning behind each technique. 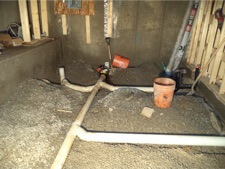 Backwater valve, sump pump and drains installed with a level field of gravel put over top. Notice the massive bench footing that was poured between the neighbours? 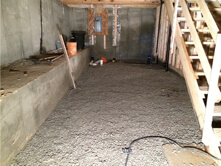 With gravel and mesh underneath, the slab was poured and levelled. 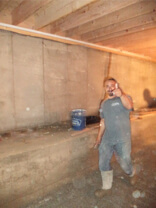 Daniel and Cosimo from COFA Construction do the majority of our concrete work. That’s Daniel giving us the thumbs up on the left. These guys are honest professionals and always easy to deal with. You can see all the walls have been insulated with vapour barrier attached. 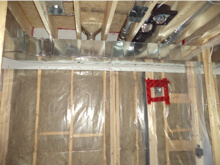 Installing vapour barrier over top of the insulation prevents moisture from getting in. The drywall, which was installed between the headers and below the ductwork where the bulkheads will be going in, act as a fire barrier. 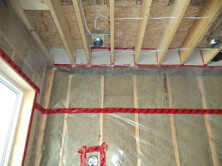 The Ontario Building Code dictates that walls which are fire rated must maintain the fire rating from top to bottom, which is why our joists are well-insulated. Technically speaking, depending on how far from the property line the house is constructed, fire regulation rules apply differently. If the house is more than 24″ but less than 48″ from the property line they require just a 45 minute FRR; if over 48″ then nothing extra is required for the exterior walls. We chose to use mineral wool insulation for this project. 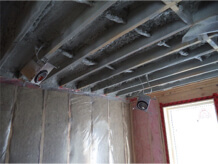 Based on it’s density and mould resistance features for exterior walls, mineral wool insulation was our best bet. The insulation rating for the walls is between R24 and R28. Finally, the flat ceilings were spray foamed. 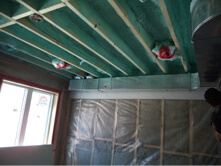 The spray foam acts as the vapour barrier for the ceiling, so there’s no need to install an additional barrier. The ceilings are insulated to a value of R42. Till next time and remember: the perfect lifestyle is up to you!